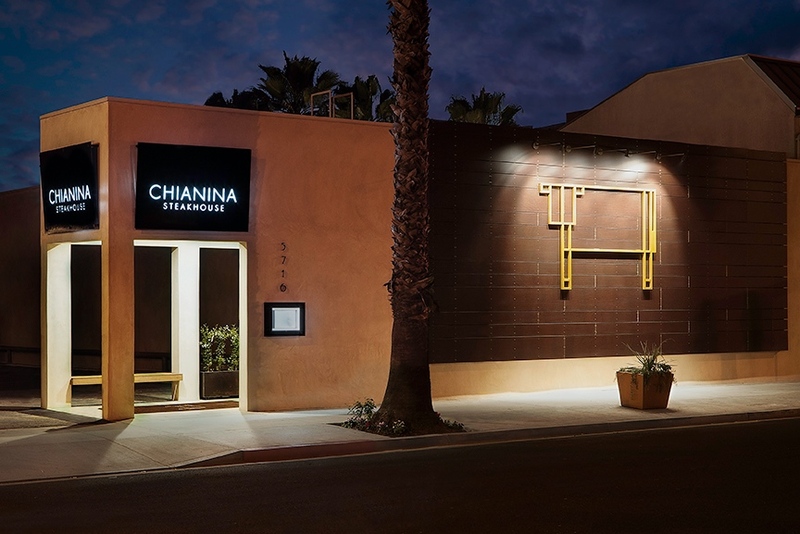 Simply put, Chianina could very well be Long Beach’s best restaurant—a feat if there ever was one considering it has only been open since December and (much to the applause of foodies across the southland) just scored its liquor license a few weeks ago after a debacle with the ABC. But truly, Chianina—the third culinary undertaking of restauranteur Michael Dene, founder of the famed Michael’s on Naples and Michael’s Pizzera—marks two trajectories for Long Beach culinary scene. 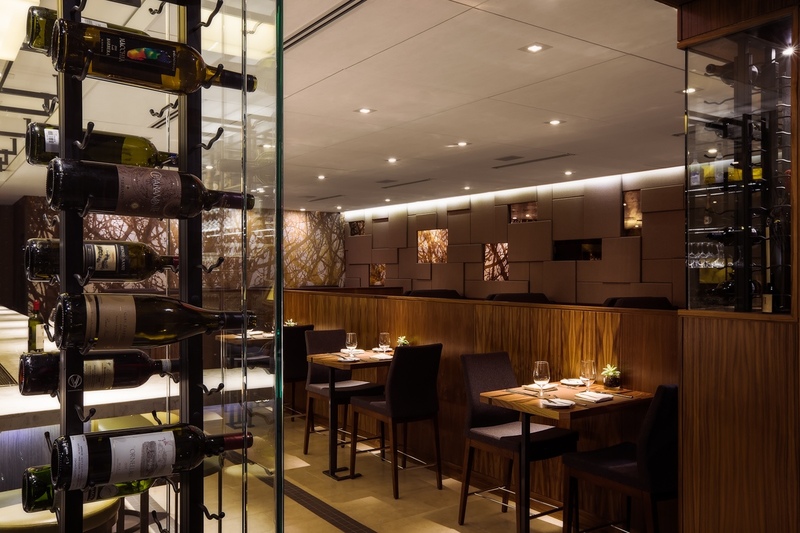 One, it represents an unapologetic return to the classic steakhouse, honoring the space formerly held by Kelly’s Steakhouse (Long Beach’s longest-running all-beef eatery); the Italian steakhouse showcases straight-forward, high-end beef with nothing more than salt’n’pepper as seasoning. Then, on the other hand, Chianina is taking a forward leap toward the era of ethical eating, where waste is not tolerated and ingredients are sourced as close to home as possible, to maintain sustainability. Not only will the restaurant have a butchery at Coronado and Anaheim to assure that all ingredients—including the beef of its cherished Chianina cattle being raised in Utah—are consumed, but manager Alejandro Duran assures eaters that no less than three-quarters of its food is locally sourced. It translates into an ever-altering amuse bouche served nightly—in my case, a deliciously smooth leek custard topped with pickled leeks from produce provided by none other than Long Beach’s own Farm Lot 59. Or, also from the Lot, an absolutely gorgeous, all-green salad of snow peas and spinach piled on top of a crème fraîche and a chile-like green garlic purée. The beauty of Chianina is, as is with all great food, in its simplicity. And the beauty of simplicity within its food goes beyond Chianina’s superbly crafted bread—the honey bun melts with a sweet’n’salty smoothness in one’s mouth while the rye harkens to some of the best classic bread this side of the Baltic countries—served with mascarpone butter or straight olive oil. 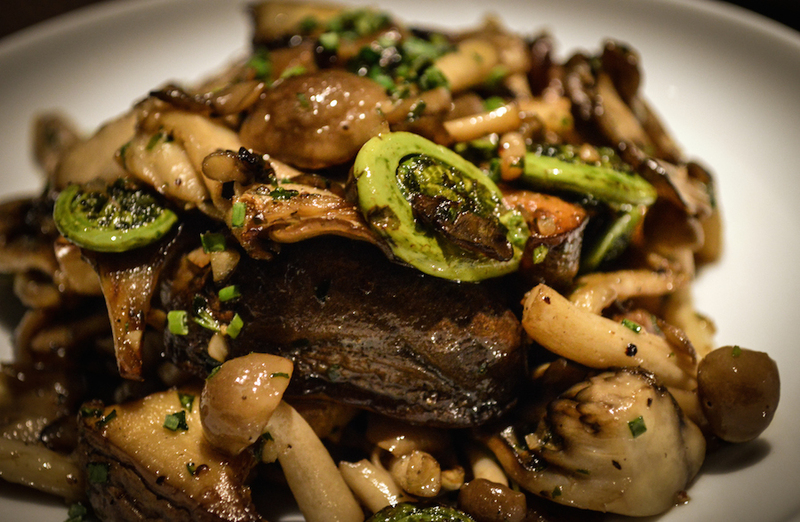 Chef Dave Coleman has a highly-welcomed aversion to overtly salted foods, as exemplified in all of his sides: the foraged mushrooms and ferns are gently sautéed with thyme, letting the earthy naturalness of the fungi come out rather than a heavy dose of butter and sodium. And his Yukon gratin? 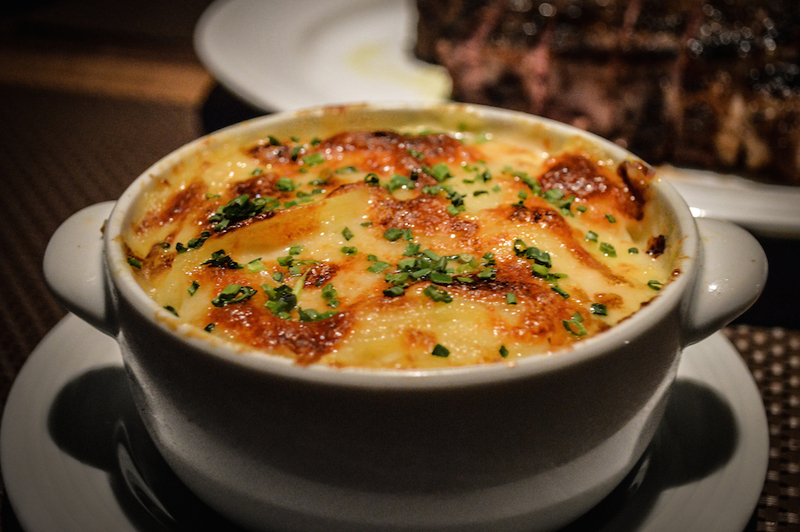 A beautifully subtle-yet-decadent combination of Yukon gold potatoes and gruyère, ricotta, and parmesan that, once again, showcases the earthy flavors of the starch and gruyère. The Farm Lot 59 green salad. But the stars of Chianina are its proteins: from pig to lamb to cow, Coleman’s interpretation and handling of meat’s flavor is not just impeccable but down-to-earth: no-frills, sauce-free (though they do offer unnecessary accompaniments, such as a bone marrow bourdelaise, for the meat grubber that is uninitiated to the quality of Piedmontese beef) slabs of meat. 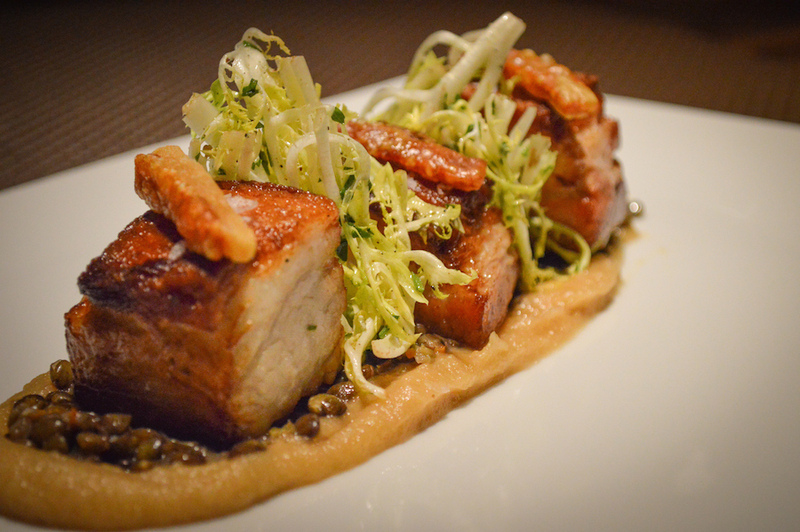 Take, for example, Chianina’s most complex—in terms of construction—meat dish: its pork belly. This perfectly balanced dish features the hard-to-obtain perfect pork belly pieces, which ultimately means a beautifully browned fatty top with tender meat. Though this sounds easy—any home chef knows that perfecting the pork belly is an art—it is rarely achieved. Put this on top of a caramel apple purée and lentils for a hint of sweet and slide vinegar-doused pieces of frisée for acidity and you begin to understand the delicacy with which Coleman approaches his art form. But unquestionably, even outside the perfect rack of Colorado lamb served with my favorite accompaniment of mint pesto, the star of the stars is the beef. As of right now, the aforementioned Chianina (pronounced kee-ah-neen-yuh) cattle is yet-to-be served but the steakhouse’s Piedmontese beef gives what Coleman and Duran describe as “almost near” the quality of the beef they plan on highlighting when their herd reaches maturity. Much like Japan’s famed kobe beef, Italy also has a cherished history in regard to its cattle, with the Chianina and Piedmontese breeds bringing about some of the most delectable cuts of red meat in the world. Chianina’s Piedmontese cuts unquestionably echo the sentiment that Italians do it better: the 90 oz. bone-in ribeye—my suggestion to you is to not suggest how you want it cooked, leave it up to the chef, and do not order a sauce to ruin it—is quite arguably one of the best steaks in town. Seasoned with nothing but salt and pepper, this massive cut needs two patrons to attack it. The kitchen serves the steak already cut into slices and, working from the outside inward, each eater slowly experiences the flavor of the protein at its most raw. The outer pieces, more well-done and slathered in seasoning, hint at what’s to come as you progress toward rarer and rarer pieces until, when one hits the middle, the carnivorous desire for unadulterated raw red meat becomes insatiable. 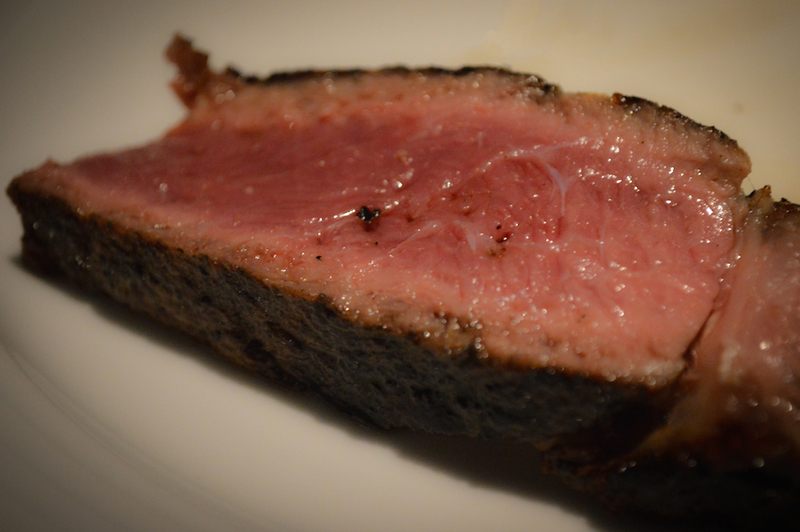 A slice of the Piedmontese bone-in ribeye. 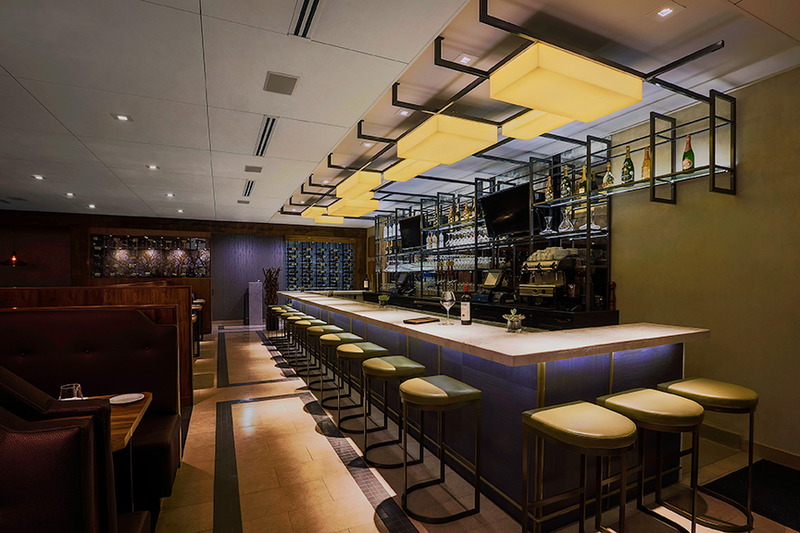 If your taste for meat is lacking, Chianina’s bar would be the place for you to plant yourself; their cocktail creations lean toward brilliant. 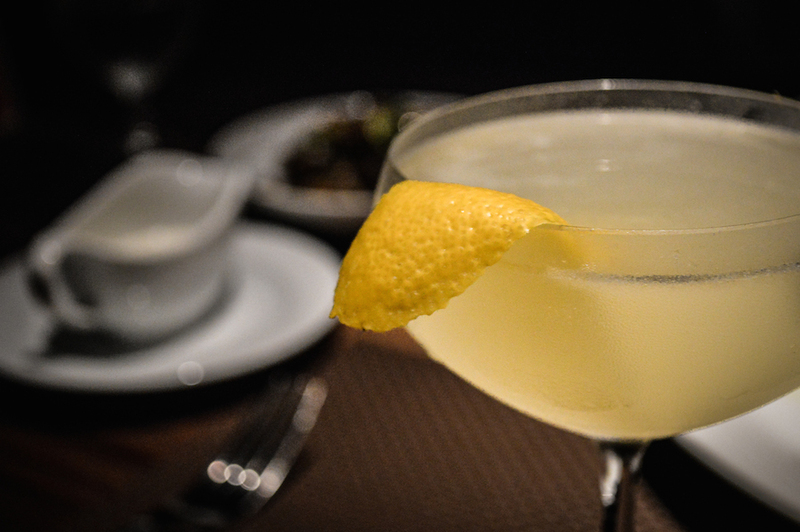 Take, for example, their celery gimlet: junipero gin, a hint of St. Germain, and the full flavor of celery create a shockingly well-made combination that is salty-and-peppery on the first sip and finishes with the classic sourness of a traditional gimlet. Or, if you’re like me, you take them up on bartender-gambling via their you-call-it Little Surprise: name your spirit of choice—in my case, bourbon—and you let the bartender have at it. The concoction returned to me should be on their permanent cocktail list: a orange-y take on the whiskey sour, bourbon mixed with an orange liqueur and citrus juice, topped with a velvety lining of egg white. It takes the flavor of a classic 50/50 Bar to a whole new level. 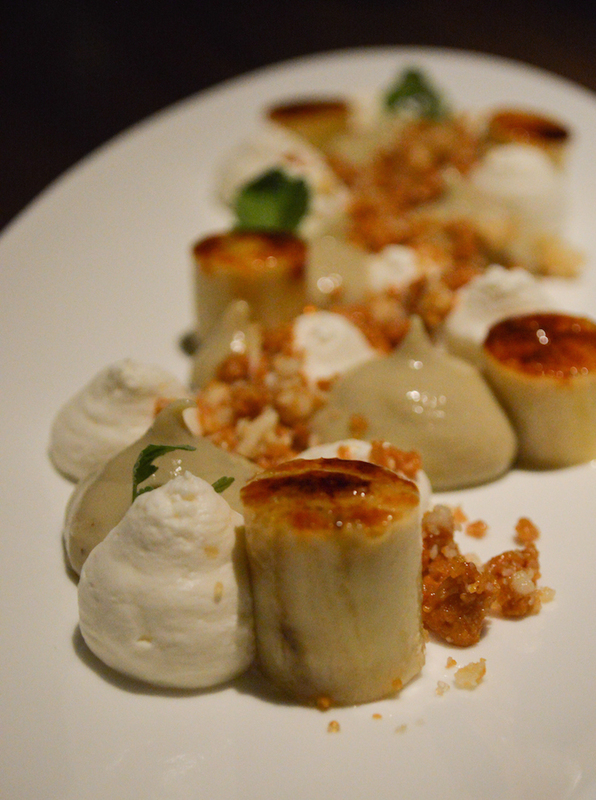 Chianina even scores on the sweet end—the downfall of many chefs—with its desserts. One can go classic—the chocolate torte doesn’t compare to Michael’s on Naples’s almond cake, my favorite dessert in Long Beach—or one can be adventurous, the route I suggest. Chianina’s deconstructed banana pudding (which is a personal weakness of mine) is nothing short of sugar heaven. Caramelized bits of banana are lined with dollops of mascarpone whipped cream and banana pudding, with a trail of candied macadamia crumbles. It’s beautifully plated and wonderfully delectable in the mouth, with the three textures of the pudding, bananas, and crumbles providing beautiful complexity. If all this is, as they put it, “almost near” where they are aiming to be, I cannot wait for the future at Chianina.